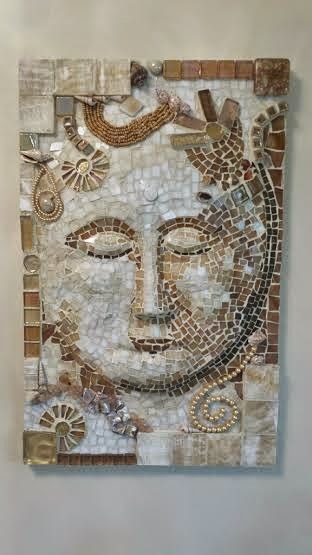 In August I posted an informal picture of a commission, delivered to my brother, of a face I've titled "Repose," which has now been installed in its final location. 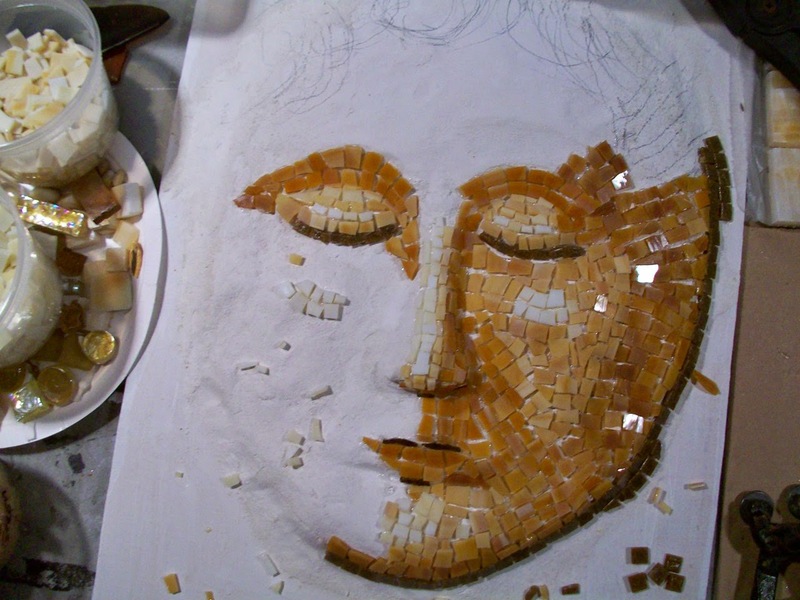 I took pictures during the many stages of its creation - the first time I've done such an involved recording of the process - and I was amazed at how it changed over the two months that I worked on it. Taking regular pictures also gave me a chance to step back and see the work differently from so close on the work table, so I was able to make adjustments as I went along. Even though you've already seen the final outcome, I thought you might be interested in how it came about. It started as an oval piece of plywood (image 1, right), with a scrunched-up piece of tinfoil where the nose goes. I used that plaster gauze material which comes in a long strip (you dip it in water so it becomes sticky and pliable) to start forming the high points of the forehead, cheeks and chin. 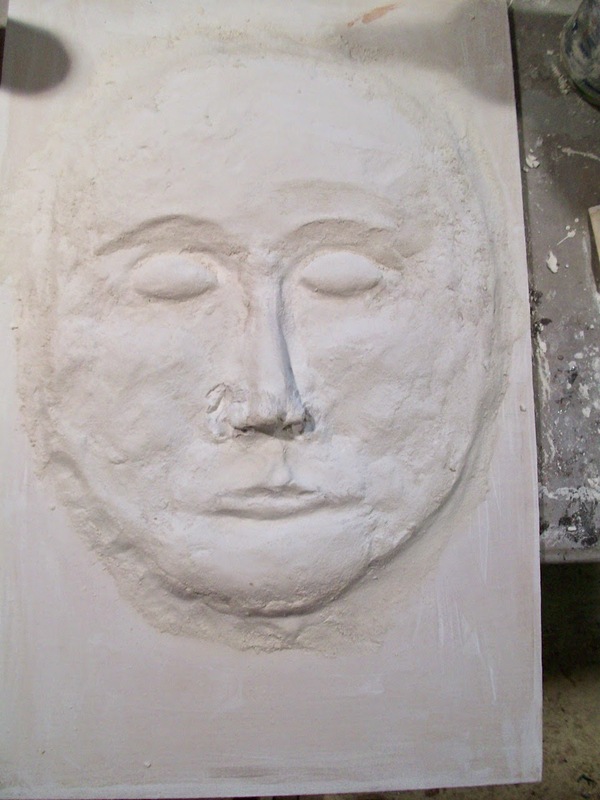 What you see in the second image is actually a third layer, where I've started using a cement-like material - it's like mortar only much finer - to form the mouth, brows and nostrils. 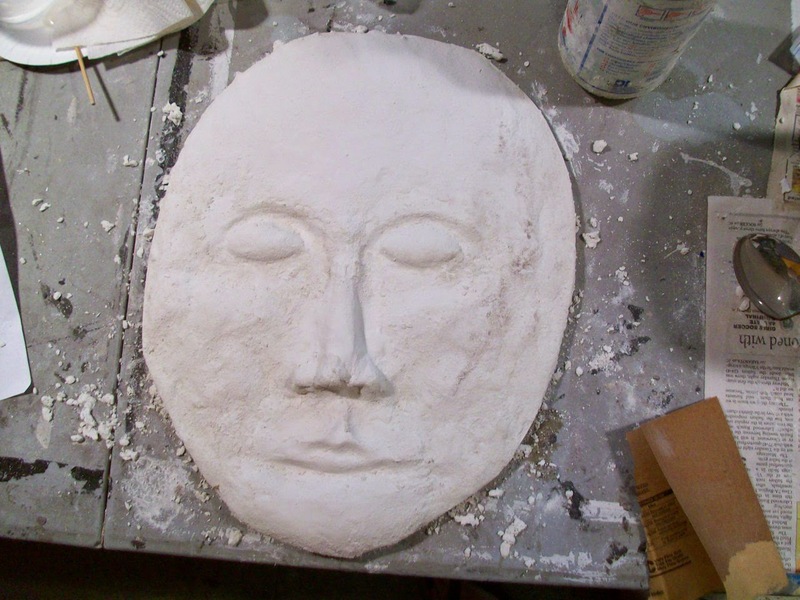 It's called Winterstone, and I get it from a sculpting supply site called The Compleat Sculptor. Here (image 2) I've added more refinement to the face and glued the oval piece of plywood to a larger rectangle which will be the backing to the entire piece as well as a sort of built-in frame. 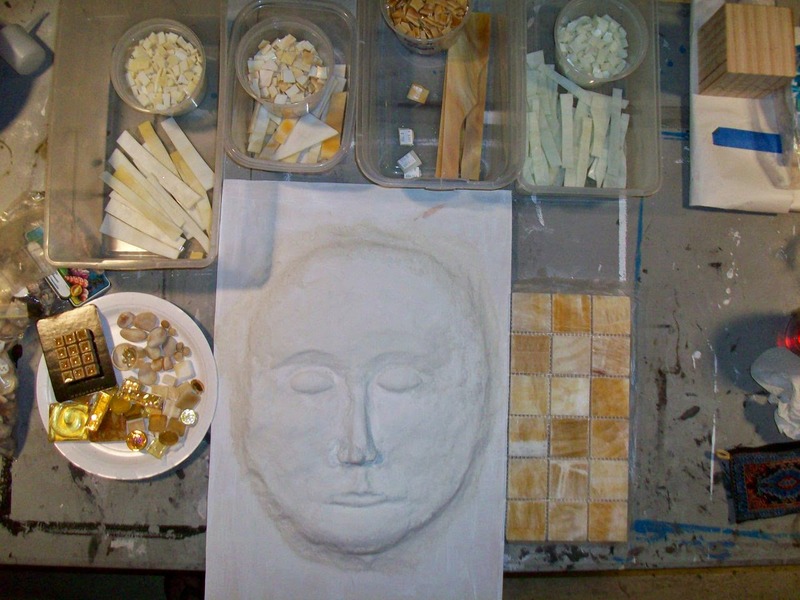 The next image (3) shows the face surrounded by all the materials I'll use to define and decorate the face: The material just to the lower right is a piece of 2-inch sections of honey onyx tiles - the same material that my brother and his wife used in their bathroom; I got some of that in order to match the colors in glass. 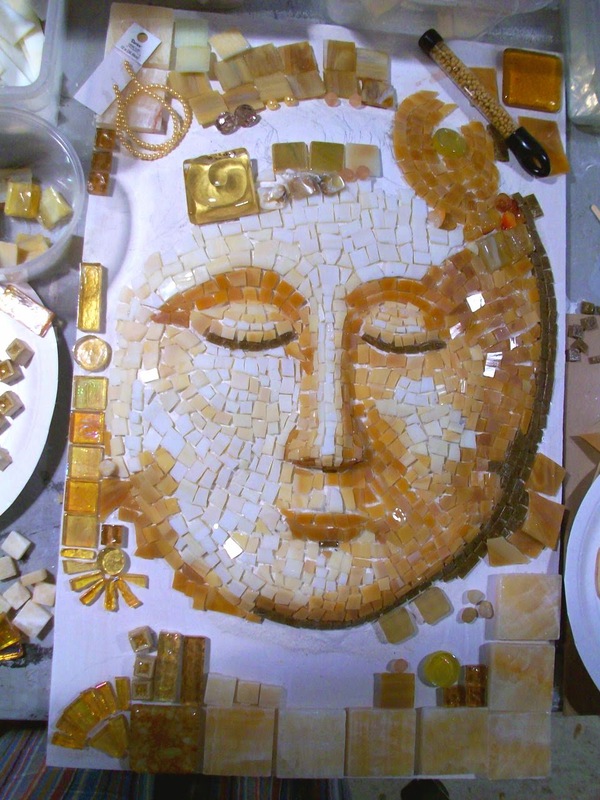 I've got four colors of stained glass arranged at the top of the image coordinated to the onyx; and at the left are various odds and ends such as gems, shells, and glass beads and tiles, all in similar colors. 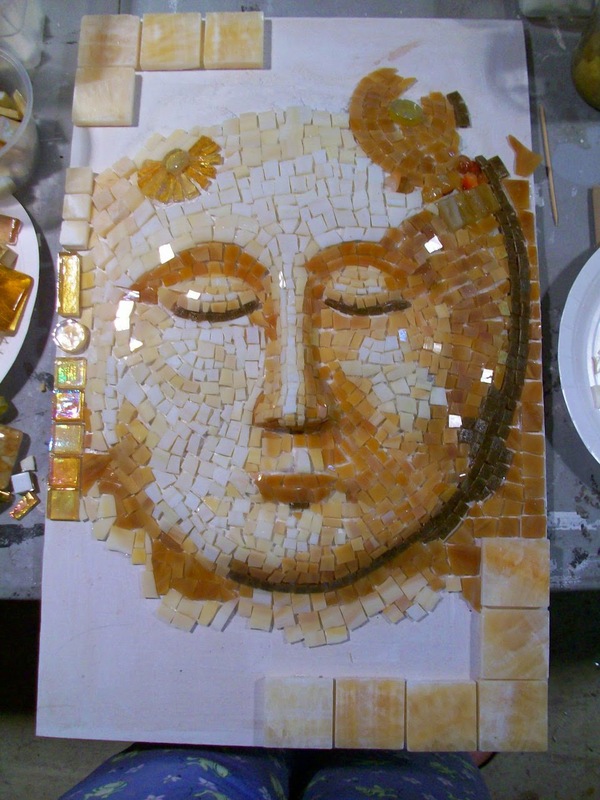 I started setting the darker areas of glass first (4), but later (5) removed areas in the cheek to show more contrast. I also didn't like the hard line around the edge of the face and above the upper lip (in the photo it looked like a mustache, so by #6 you can see I changed the mouth!). In every work there is at least one area that I have to scrape off and redo. In this one I also later changed the upper right treatment above the forehead before I finished. Taking photos also alerted me to the fact that the cheeks were a bit too rounded-looking, so I added more hollowness by darkening the glass pieces at the lower left and right - you can see those changes in images 7 and 8. I had to make many decisions about the border pieces, and the photos helped immensely with those in terms of balance and weight. 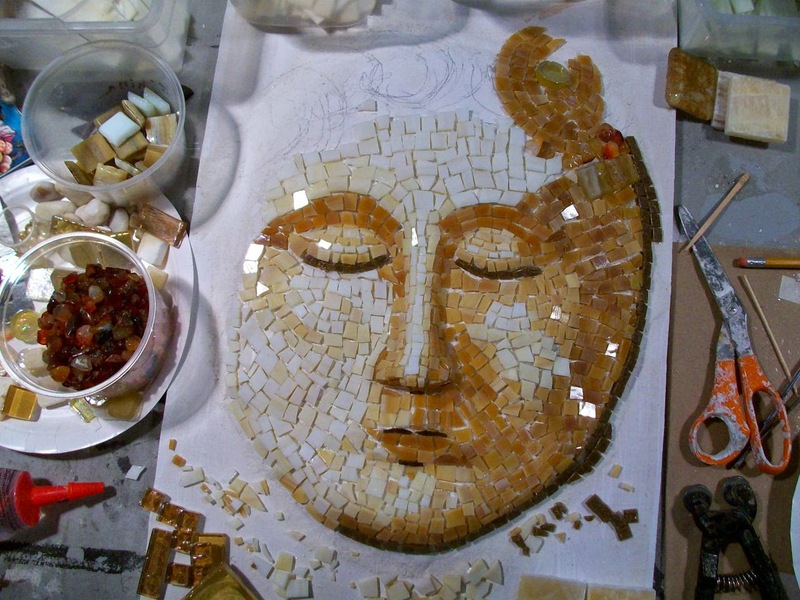 I found myself taking a photo every time I arranged a few beads or tiles and checking the layout in the viewfinder. There were many test shots between image 8 and 9, and the final result, shown in the last image. Do you remember the first stage of Pearlbird from, oh, at least a year ago? It was probably more than that. 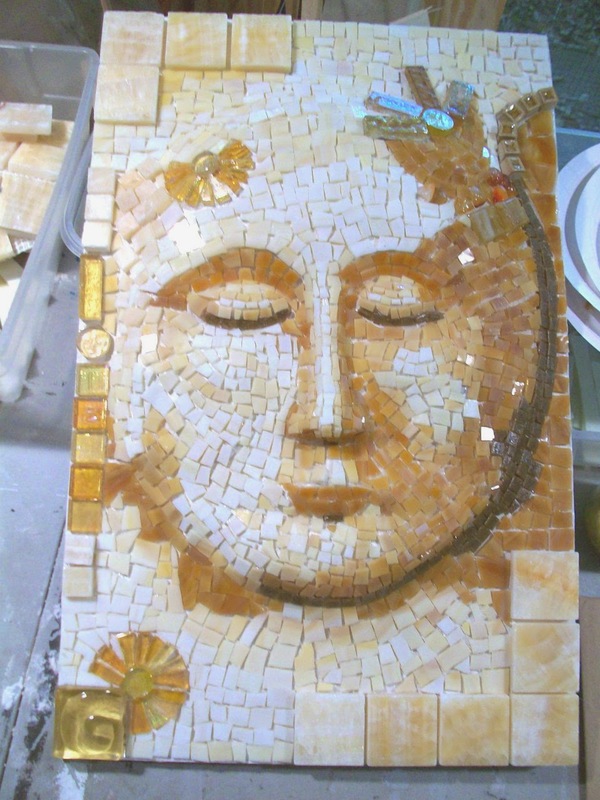 It got shelved when I got stuck after gluing the pearl outline and couldn't figure out how to continue: fill in the background with tight swirls of transparent beads? Leave just the outline? Fill in the outline? I bought a package of those rainbow-translucent beads but then they just sat on the shelf with Pearlbird for more months until one day this week when I got a chance to do a sort of "pop-up" exhibit at Towles Court. The landlord of the building where Ashby Art used to be, which is currently empty, graciously allowed a group of artists to rent the space for a night to show our work, and I was one of the lucky ones. I decided to include Pearlbird - which meant I had to finish it! And all at once I knew that stringing the translucent beads and filling in the outline was the solution, so that's what I did. 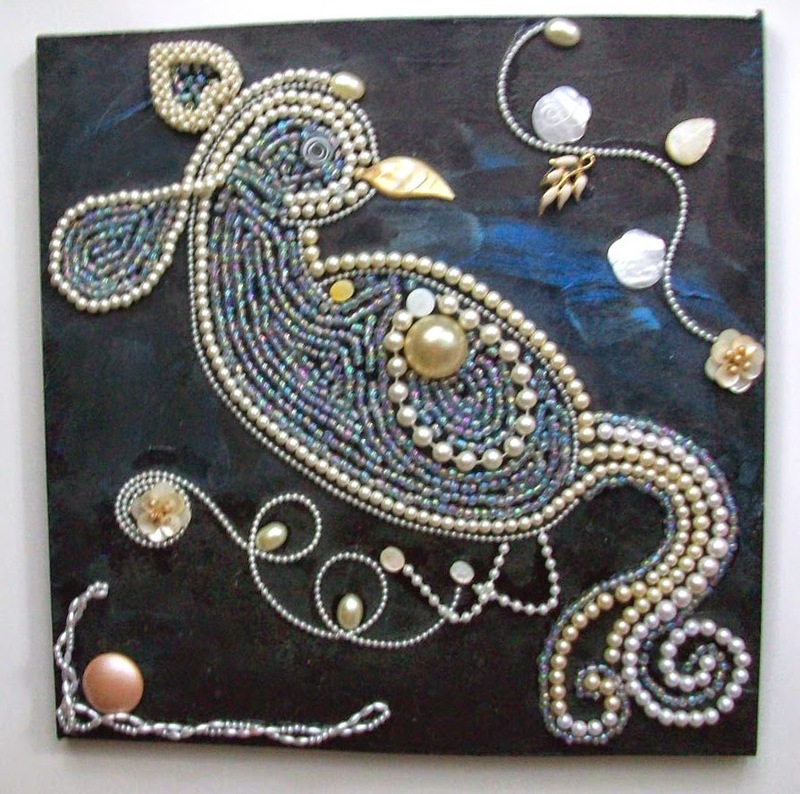 I added a few more touches of blue to the night sky and a few more pearls and it was done.